Though much news coverage of Islamic State (IS) focuses on developments on the battlefronts between IS and its enemies in parallel with ephemeral assessments claiming IS is either winning or losing, little is known about the training camp processes and the army-like divisions. This post, translating and analyzing the testimony of a pro-IS source in Mosul called Omar Fawaz, aims to remedy this deficiency. Several points speak in favour of this source's reliability, beginning with the fact he has attached photos of two of the books he references as part of Shari'a learning for training camp recruits. At least one media report has previously referenced the text 'Stipulations on Tawheed' as being used in the IS training camps and even supplies a photo clearly showing the book's subtitle: 'For the training camps' (see below). Unsurprisingly, the Bahraini cleric Turki Binali, he who wrote IS leader Abu Bakr al-Baghdadi's unofficial biography, appears to play a key role in the training camp education material as part of his wider centrality to IS' Eftaa and Buhuth department that most notably specialises in Islamic State fatwas. More generally, Omar Fawaz has been referenced approvingly by another account called 'Iraqi Sunni Witness', who has supplied useful photos of IS documents from the Ninawa area, some of which I have incorporated into my own archive of IS administrative documents. 'Iraqi Sunni Witness' has hailed Fawaz's prior visits to other Diwans (state departments) of IS, and this latest report should be viewed in the same light as an important resource. Finally, an examination of Fawaz's other photos shows he is indeed in the Mosul area. a) Differences in training camp attendance period for the ansar (native Iraqis and Syrians) and muhajireen (foreigners), most likely due to the fact that the muhajireen generally have less military experience and less familiarity with the environment. b) The existence of a military diwan of IS: the fact little/no administrative documentation has come to light so far does not cast doubt on its existence. For comparison, IS is acknowledged to have a Diwan al-Asha'ir (tribes department) but I have found only one document so far from this division of bureaucracy. c) IS' desire to export military manpower to its affiliate provinces abroad. The question of capability is more open to debate: Libya seems to be the only likely case thus far of exporting from IS central, but the IS project in Libya has already faced serious setbacks with one of its most developed outpost presences- in Derna, Cyrenaica province- having recently been dismantled by other rebel factions there. Below is the translated testimony (original here). The means of applying to the camps differs according to whether the applicant is from the Ansar or the muhajireen. 1, Beginning with application and the filling out of an application questionnaire, giving comprehensive information including education attainment, skills and talents, inclination of thought, and tazkiya (vouching) or lack thereof. 2. Sessions for cub scouts between ages of 5-15 years, as for adults, 15 and above. 3. The day for training begins after dawn prayers when the trainee is taught adhkar and du'a and memorizes Qur'an. 4. Then the Shari'a sheikh comes to give a Shari'a lesson continuing till 7 a.m.
5. Physical training begins with normal morning exercise followed by eating breakfast. 6. Then Salat al-Daha and body perfection training. 7. Then training in arts of fighting. 8. After noon prayer, lunch is eaten for a little break, then another Shari'a lesson. 9. Then a visual demonstration of weapons, their types, how to use them, and how to dissemble and assemble them. 10. After afternoon prayer, practical training on medium and light arms. 11. Trainees alternate between training sessions and Shari'a sessions till 10 p.m.
12. The Shari'a session consists of teaching four abridged books: Stipulations on Tawheed, Stipulations on Fiqh, Manners of the Mujahid, the Fiqh of Jihad. The trainee must memorize 1-2 parts of the Qur'an and memorize and understand the book Stipulations on Tawheed. 4. 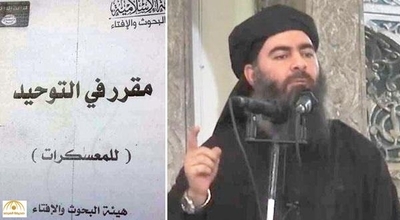 The Caliphate army (choice depends on stern conditions the most important being not thinking of marriage and service will be in the lands of the Caliphate in the wilayats outside of Iraq and al-Sham, and other conditions). 6. Prior demand from one of the Diwans (when some of the applicants come from the path of the Diwans of the state that need them and according to their special vocation). 7. Administration (comprising trainees who completed their education at the hands of specialists and similarly trainees who excel in use of electronic devices and accounting). 8. The rest are distributed in fronts and camps after the end of the military camp training according to where they are needed. After the end of military training is a Shari'a test for the trainees from one of the senior sheikhs of the state, then the bay'ah is taken from him. (Photo: the books issued by the Buhuth and Eftaa Committee in the Islamic State written by the most important of the sheikhs and Shari'a clerics of the state as Sheikh Turki Binali).